Since its inception in 1999, Atomic has focused on converting their deep knowledge and love of the history of jazz, along with well-honed chops and artistic vision, into beautiful, fresh, creative music -without emulating. 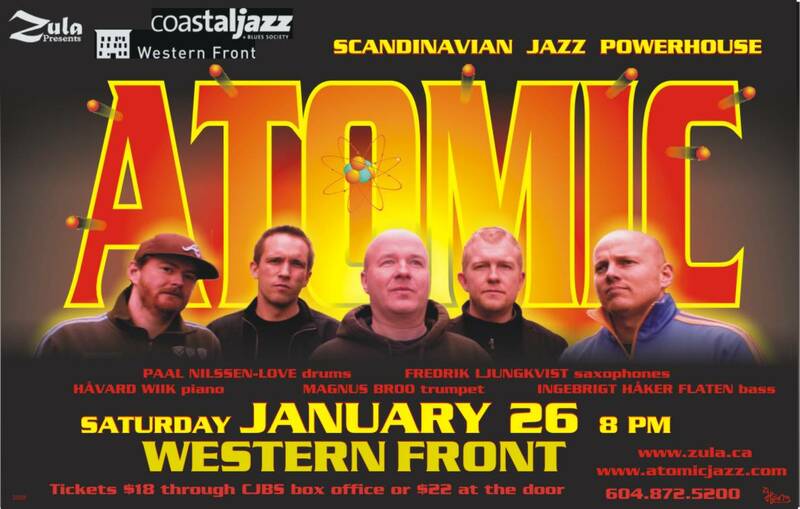 Atomic plays original music, mixing grooves and modes with a distinctive approach to free playing. Think classic Miles Davis meets late-period Coltrane meets Art Blakey & the Jazz Messengers, filter through Albert Ayler, Andrew Hill, Ornette Coleman influences and you’ll get an idea why their terrific sounds have spurred collaborations with leading contemporary jazz musicians, including Chris Potter and Ken Vandermark from the U.S., Iain Ballamy from the U.K., and the Swede Per ‘Texas’ Johansson. When traditional Indian rhythms meet popular Western instruments,an irresistible new sound is born. 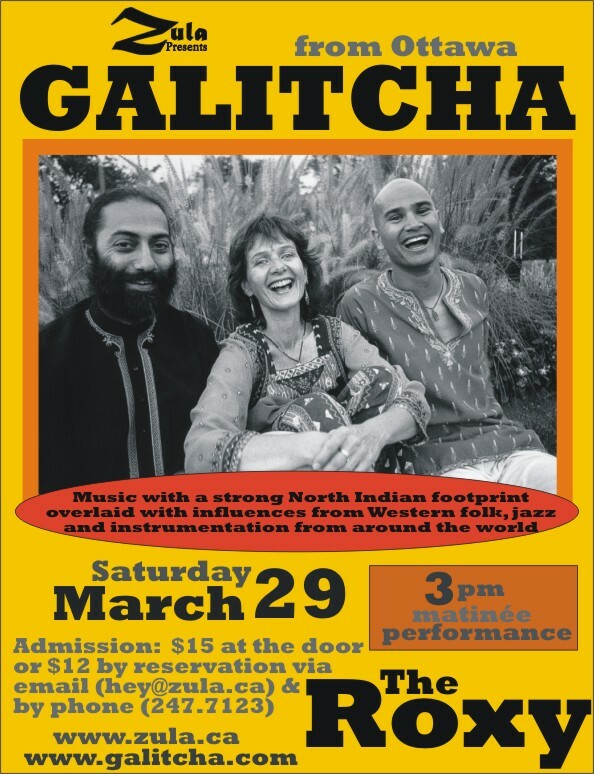 GALITCHA invites audiences to experience a host of musical sensations – from love songs to lively dance tunes. Alternating between French and English, the performers explain the meaning of songs sung in the Punjabi, Urdu and Hindi languages. 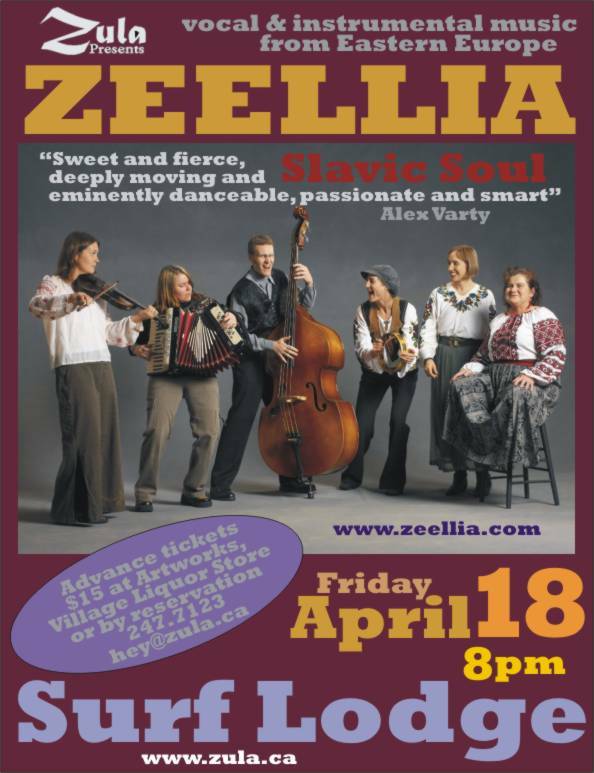 Zeellia perform Eastern European folk songs in the traditional style of ‘bilij holos’ or ‘pure voice’, Slavic Soul, rooted in the traditional with a contemporary edge, connecting the past with the present and the old country with the new. 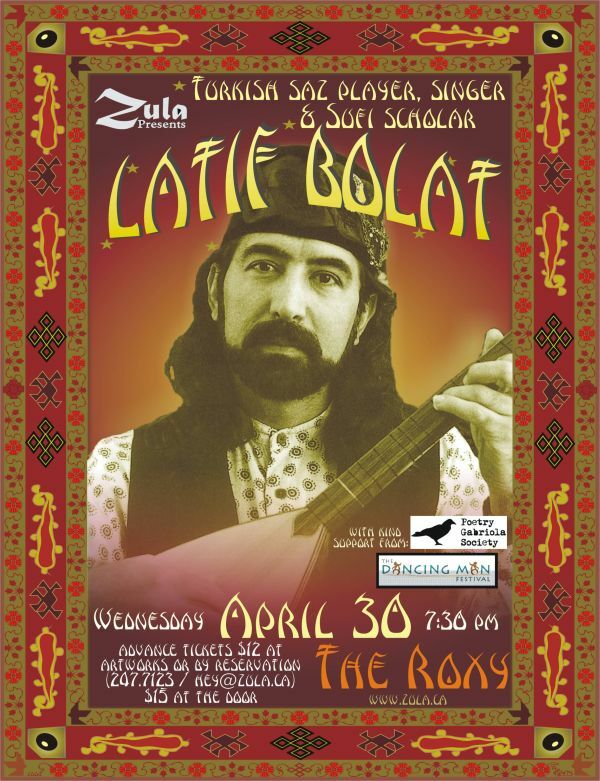 A globally known and revered musician in the genre of Sufi music, Latif Bolat plays saz and sings devotionals by 13th Century mystic-poets Yunus Emre, Mevlana Celaleddin Rumi and others, as well as Turkish folk music, rarely heard in these parts. As a scholar of Turkish music, musical and socio-political history, Latif Bolat educates, while deeply moving and entertaining his audience with his musicianship. A typical evening concert is preceded by an all too engaging lecture, story-telling session peppered with poetry and breath-taking slide images of Turkey. Whirlers and other dancers of joy and surrender are common place, as Bolat’s music is deeply spiritual and unwaveringly authentic! Whenever Chicago reeds player Ken Vandermark and Oslo drummer Paal Nilssen-Love get together to play music, sparks fly! These world-renowned, creative souls have released three albums and toured together for a decade , as well as having collaborated on other projects (School Days, FME, Brötzmann Tentet, etc.). They will be performing for the first time as a duo in BC! 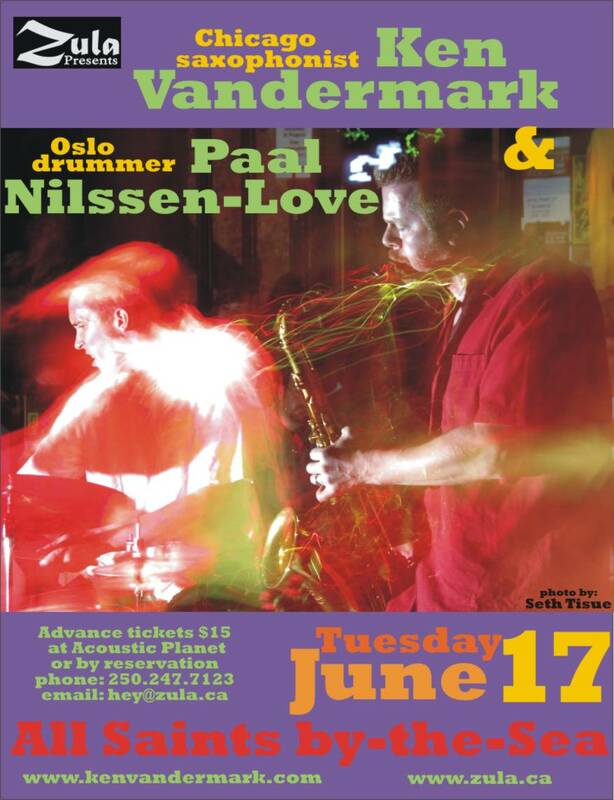 Vandermark is stretching the tenor, baritone saxophone and Bb clarinet in a continuous flow of tones and timbres, whilst the Stavanger-drummer Nilssen-Love proves his reputation of being the avant-garde jazz’ most powerful mallet and stick wizard. However, Vandermark’s logical lines stir the flow of energy. Though tonal and rhythmic patterns/structures appear, the duo does not seek simple solutions. This is raw music, with a brutal beauty, which becomes more and more exhilarating the more you let the music take control of body and mind and set aside the normal understanding of nice and ugly. 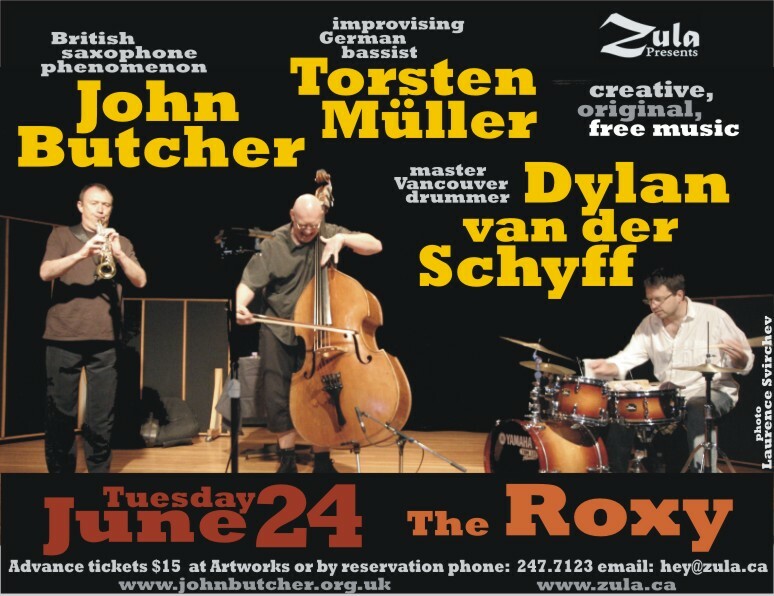 British saxophone phenomenon John Butcher meets again this outstanding “rhythm section” of Vancouver heavy-weights, bassist Torsten Müller and drummer Dylan van der Schyff, for creative music of a very high order! Soprano and tenor saxophonist John Butcher is a wonder of modern music, master of a saxophone vocabulary that he has developed to a rare level of expression and execution. A first offspring of the London free-improvising revolution of the 1970s, he employs a vast range of saxophone sounds, from the traditional to the most idiosyncratic. Since moving to London in the late 1970s, he has collaborated with a who’s who of the world’s great freely improvising musicians, and he continues to be in demand for recording and performance appearances around the world. German bassist Torsten Müller, now residing in Vancouver, B.C., has long been at the forefront of international free improvisation. Woefully and inexplicably under-recorded, the innovative Muller has radically departed from the sometimes limiting traditional sound of, and approach to, the double bass. Muller has enjoyed improvised music meetings with many of the most accomplished musical artists of the day, including the late Paul Rutherford and Ken Vandermark. He is also co-curator of one of the world’s finest annual showcases of free improvisation, the Time Flies Improvised Music Meeting, held on three nights in February in Vancouver. Percussionist extraordinaire Dylan van der Schyff brings masterful chops and scintillating sensitivity to a wide range of musics, from small-group jazz to big band extravaganzas to the most adventurous free improvisation. His expanded drum kit vocabulary and uncanny sense of what the music requires put him at the top of the list for co-conspirators from Vancouver and around the world. Evan Parker, George Lewis, Dave Douglas, Mark Dresser, Mark Helias, Barry Guy, Michael Moore — van der Schyff’s list of high-profile collaborators goes on and on.